This is a perfect saying for a perfect girl who is my guest today and i attracted towards her blog because of her different and interesting ideas.I am here introducing Sadaf of “CHEF IN FRAME“. I’ve loved following her and watching her blog grow as she entices her readers with delicious recipes and pictures. Today I’m sharing same delight of sooji (semolina) dessert. 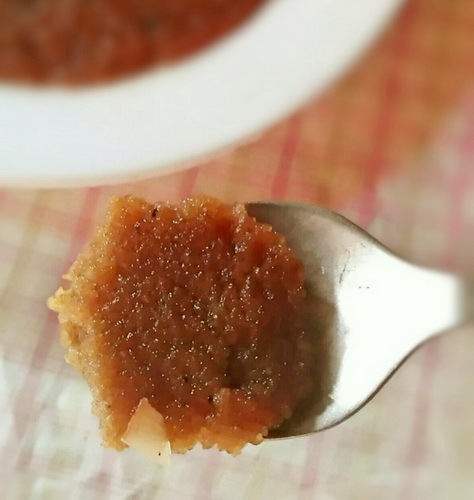 Sooji & basan ka halwa, a.k.a Semolina and Gram flour dessert. Heat the milk and sugar until simmer. (make sure sugar dissolved) Put it aside, you’ll need it in a while. Add ghee/oil and cardamom seeds in a non-stick wok and put on stove over medium-low heat. Add gram flour and semolina, fry on a low heat, stirring continuously until gram flour starts changing color to light brown. Fry it till mixture starts to take a light brown shade than golden brown (keep stirring continuously). Frying will take about 10 minutes. Add in milk mixture, (see first step) stir immediately. 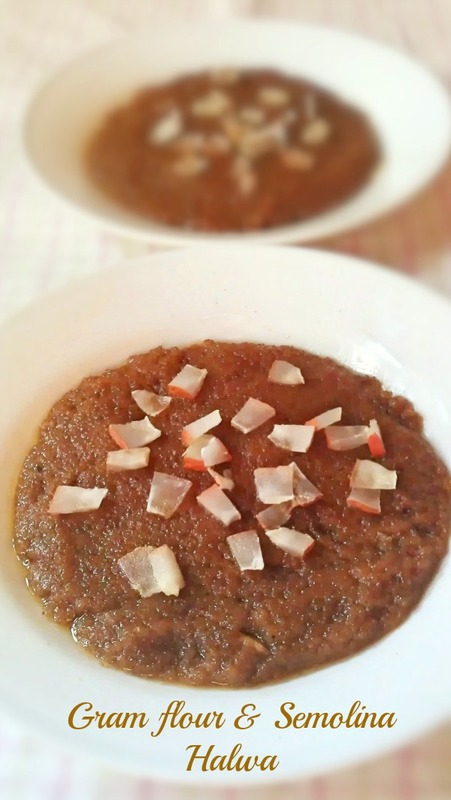 Simmer and cook for 10 minutes or until the water is absorbed and the halwa is thicken. When all done, transfer to serving dish. Serve to your happy family. i made this recipe on this shab barat,result was out standing!!! i had a suggestion to give u ainy, if u pick the pictures as u cook the recipe step by step in between cooking, this will help alot to understand for new cookers as well as us, what u think? Thank you Moon hope you will try more recipes too and surely i will try to post recipes with step wise pics.